(Old) Northside Historic District is the city’s finest collection of high-style Victorian-era architecture. Home to prominent politicians, business owners, and attorneys, the neighborhood is lined with impressive brick and wood frame Italianate and Queen Anne mansions, mostly built between 1870 and 1900. While Lockerbie Square was developing in the 1850s, this area just north of downtown was still considered too far away to be useful for residential lots. One of the main landholders, Ovid Butler, a successful attorney, built a Greek Revival farmhouse in 1848, at what would become 1306 North Park. His convictions led him to become involved in the abolitionist cause, and he began a newspaper, the Free Soil Banner. Butler also was active in the Christian Church, and a founding member of a church board that sought to establish a Christian Church-based university. With the college and a handful of people who moved there when it was still “rural," the area became an intellectual community of well-to-do residents. The coming of mule-drawn trolleys and extension of streets brought more development after the Civil War. Benjamin Harrison moved to the neighborhood in 1868. Harrison, a Civil War veteran and partner in a successful law firm, held a seat in the U.S. Senate from 1881 until 1887. The Republican Party nominated him for president in 1888, and he was elected the 23rd president of the United States. Other law and political figures were also attracted to the area. Thomas Taggart, mayor from 1895-1901 and National Democratic Chairman during Teddy Roosevelt’s presidency, built at 1331 North Delaware in 1913. Noble Chase Butler, a U.S. Circuit Court judge, lived at 1204 North Park for many years in the late 19th and early 20th centuries. Business owners added to the social mix in the 1880s and 90s. Prominent families moved away after the Depression. New owners converted homes to apartments. When highway planners routed a downtown leg of I-65 through the area, dozens of significant homes were razed isolating the remaining intact segment of the neighborhood. Revitalization efforts began in the early 1970s. Historic Landmarks Foundation of Indiana gathered funds to restore the Morris-Butler House, a significant Second Empire-style house. Gradually, families were lured back into the neighborhood by revitalization efforts. The Indianapolis Historic Preservation Commission has guided ongoing restoration since 1979, when the area was designated a historic district. A tour of the neighborhood could begin at the Old Centrum (former Central Avenue Methodist Episcopal Church, 512 East 12th Street, designed by Dayton, Ohio, architects Otter & Williams in 1891, and one of the better examples of Richardsonian Romanesque in the city. The octagonal tower with stone checkerboard openings at the top is remarkable, and the inside of the sanctuary includes an “Akron Plan” auditorium with fanned-out banks of pews. Down 12th Street at 1204 North Park is the French Second Empire style Morris-Butler House. The home, built in 1864 -65 by banker John D. Morris, is thought to have been designed by German born Dietrich A. Bohlen, one of the first trained architects in the city. Morris lost the house in the financial panic of the 1870s, and District Judge Noble Butler and his family moved in. Historic Landmarks Foundation of Indiana guided the restoration of the house, now open to the public as a museum of American Victorian-age life. The Gerstner-Dalrymple House at the southwest corner of 13th and Park was built by a German tailor in 1873. In the early 1900s, John Dalrymple, president of both the Indianapolis Saddlery Company and an insurance firm, bought the house. It has incised work on the stone window surrounds and richly embellished sheet metal entablature. Ovid Butler’s “Forest Home” stands across the street at the northwest corner of 12th and Park. Delaware Street has some fine Italianate houses from 13th Street north, including the Benjamin Harrison House, a National Historic Landmark. The Harrisons hired Herman Brandt in 1871 to design their brick Italianate house, and later, architect Louis Gibson to design the Neo-Classical wrap-around porch. 1410 Delaware is a locally outstanding example of Romanesque Revival. John Schmidt, owner of Schmidt Brewing Company, was the first resident in 1892. In 1902, another brewer, Joseph Schaf and family, moved in. The Propylaeum, a private women’s organization, has owned the house since 1921. The Harrison Art Center is at 1505 Delaware. (Old) Northside Historic District is roughly bound by 16th St., I-65, and Pennsylvania and Carrollton Sts. Most buildings are private homes. 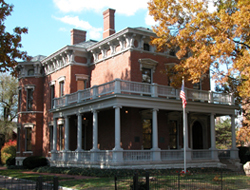 The President Benjamin Harrison House at 1230 North Delaware St. is a National Historic Landmark. Click here for the National Historic Landmark registration file. It is open to the public. The interior includes authentic furnishings and belongings of the family and displays on the accomplishments of the Harrison administration. Call 317-631-1888 for tours and hours. The Morris-Butler House at 1204 North Park, is also open. Call 317-636-5409. Harrison Art Center, 1505 North Delaware is open during business hours, offering programs and hosting contemporary art shows, art studios, and live music in the historic Redeemer Presbyterian Church. Consult Harrison Art Center website or call 317-396-3886 for more information on gallery openings or special events. INDYGO bus line from downtown: #17 College, disembark at 12th St. 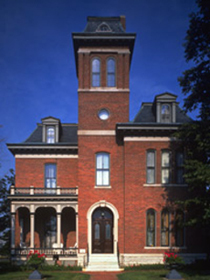 The Benjamin Harrison House and the Morris-Butler House have been documented by the National Park Service's Historic American Buildings Survey.